Recently i cam across this library in CRM 2013. And I found a lot of helpful methods which could facilitate you during your development. Please check for the screenshot below which shows some of the methods. 3. Xrm.Internal.openDialog – this you can use to show a modal dialog in a similar manner in which CRM 2013 shows the modal dialogs. 4. 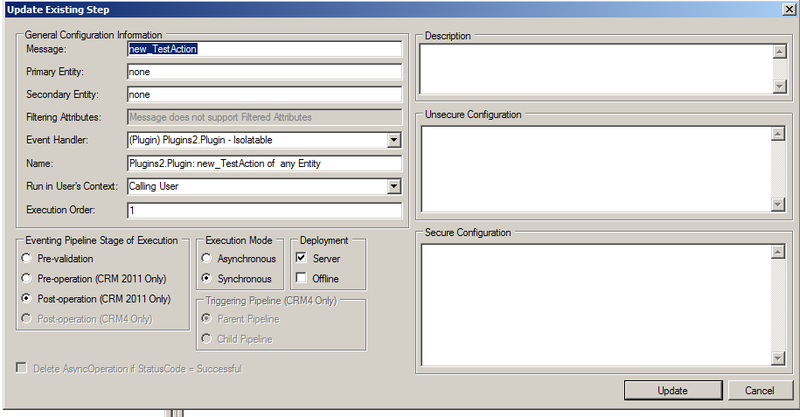 Xrm.Internal.openErrorDialog – this you can use to show an error dialog like CRM 2013. Check out the following link to see how to use the above methods to suit your needs. Please note that is a not a documented library for end users and hence any changes to library by microsoft in the future would render you code unusable. 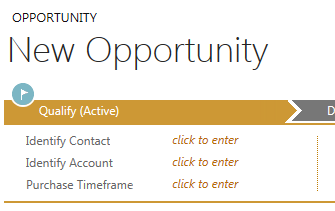 By now many of you might have already explored the concept of Access Teams that has been introduced with CRM 2013. If not then I would suggest to go through it. Personally i kind of liked it as it helped me to escape sufficient amount of coding in my current project. In this post, I will not explain how CRM 2013 Access Teams work functionally. But I would rather explore as to what does CRM do underneath to make it work. I have logged in to CRM with a user who has sales person security role in CRM. I have a custom entity called ‘Test Entity 1’ in my CRM. The sales person security has the following privileges on the Test Entity 1. Check for the screenshot below. 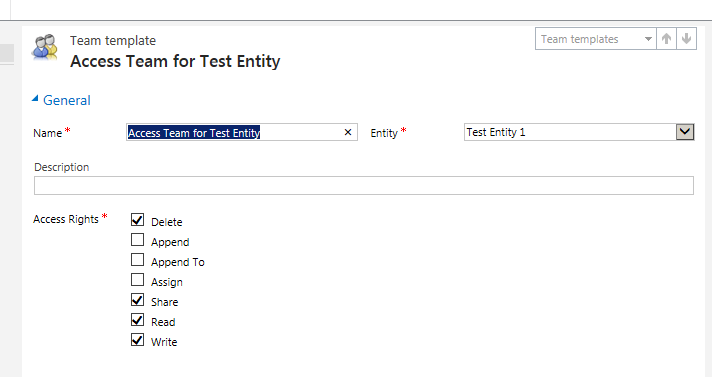 Now I have also created an access team template for Test Entity 1. I have configured the Access Teams on the form of Test Entity 1 and opened a record of the entity called ‘Test Entity Record 1‘. Check for the screenshots below. Now I go ahead and add the user ‘Test Crm User 1′ in the access teams grid of the opened record. The user now have the privileges to this record as per provided in the access team templates. Let’s check now how is this made possible in CRM. 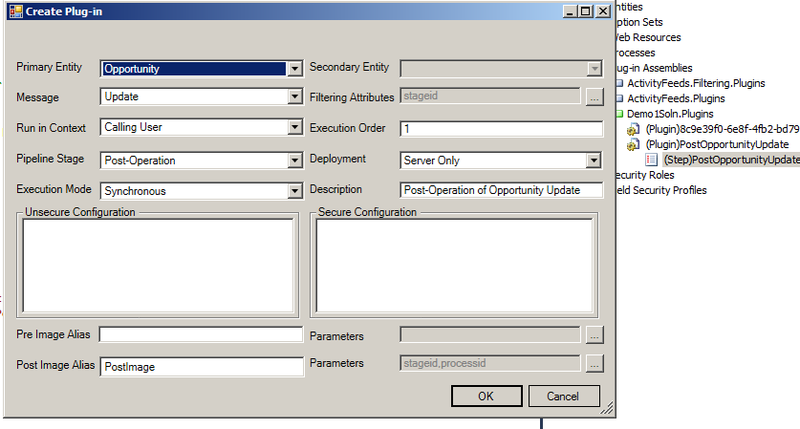 I open SQL server database and query the Teams table order by createdon descending and following is the result i get. Let’s check what the first guid refers to. When I query the PrincipalObjectAccess table with the ObjectId = ‘33835ea1-978d-e311-b84b-463500000031′, the following is result I get. Here objecttypecode = 10005 in my system is the Test Entity 1 entity. So CRM underneath created a new Team and shared the record with the newly created team. The principalid field value is nothing but the ID of the team. So now let’s explore the second guid of the team name – ‘5c2bde09-60c8-e311-9bb1-463500000031′. This is nothing else but the id of the access team template. Please check for the screenshot below. Now what happened to the user that has been added to the access team. Let’s pull out the team from the advanced find view. Hope this helps you in understanding the underlying structure of CRM 2013 Access teams. Recently while configuring outlook for our client, we got the above mentioned error. Also strangely it was working prior to one of our deployments that we did in the organization. So we became pretty sure that it has something to do specific with our latest customizations that we deployed to the environment. What we did is we compared all the changes that we made in the recent deployment, specifically the Enum fields, since the error says that it cannot parse the Enum value. What we found is that, the “searchable” property of the field “importsequencenumber” of one of the custom entities has been changed to “No”. We set it to “Yes” and published the customizations. After that we re-opened outlook and tried to configure the Outlook client and all worked well much to our joy. Hope this helps and saves you some time when you face similar issue. On Change of process or stage for an entity, CRM allows you to register workflows. 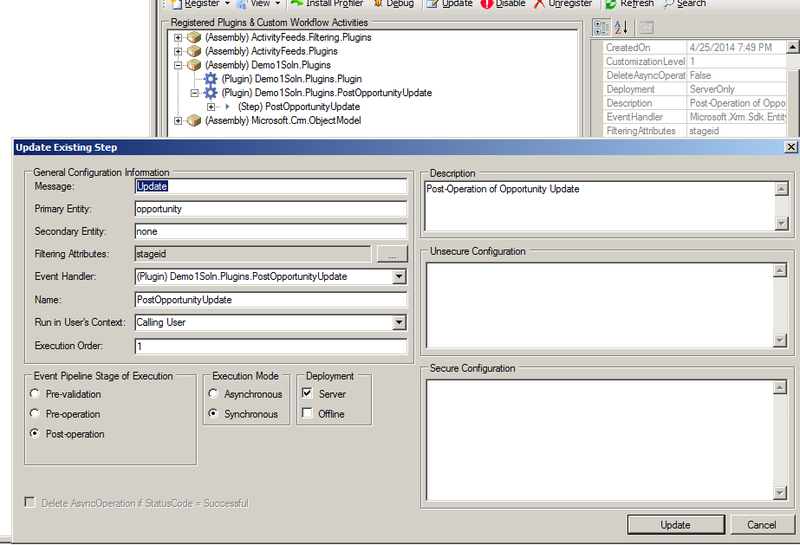 However through plugin registration tool, it is not possible to register plugins on change of stage or process. 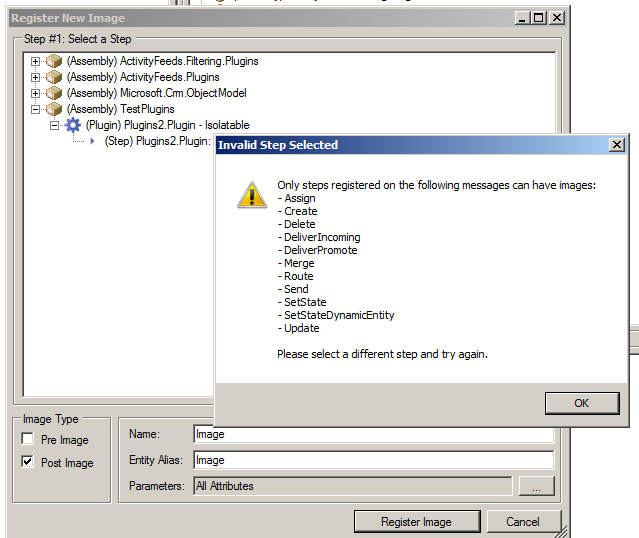 Also in images for steps you cannot add the processid and stageid parameters during update/ post create of the entity. You have to write separate queries altogether to fetch the processid and stageid for an entity during create/ update of entity in the plugins. However there is workaround which helps you to achieve all of this in a very simple manner. Let’s see how this can be achieved. 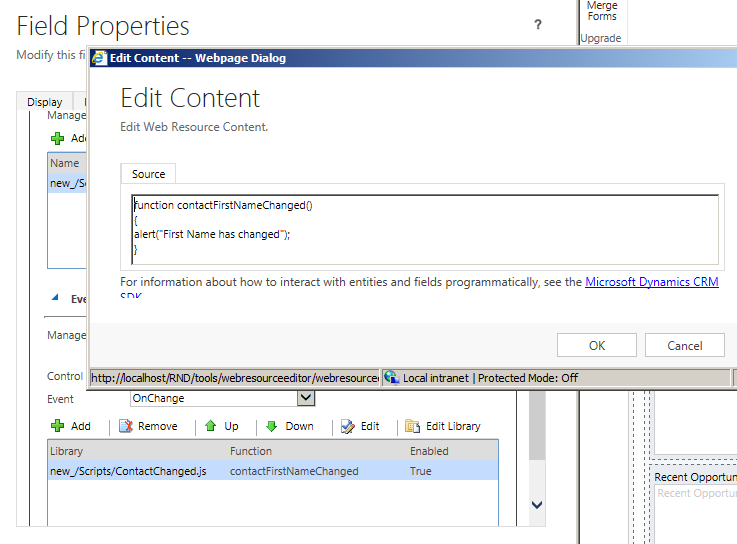 CRM 2013/ 2011 SDK ships with the developer toolkit. 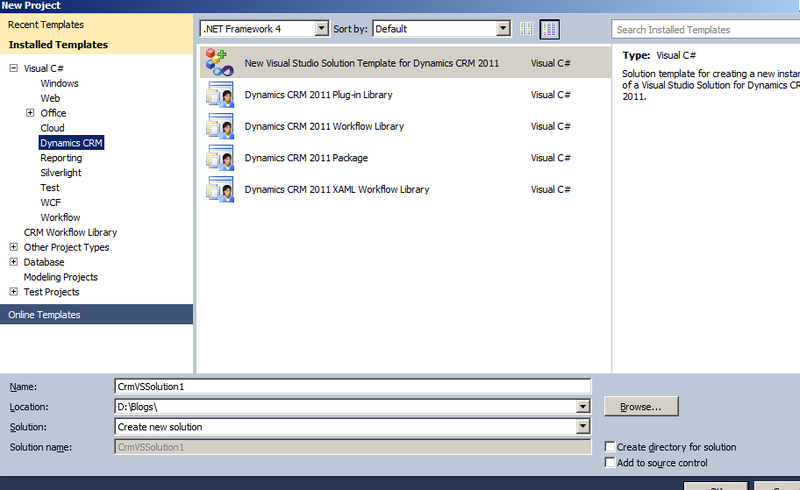 Once you install the developer toolkit and open visual studio, you get an option to create CRM Solution. Check for the screenshot below. 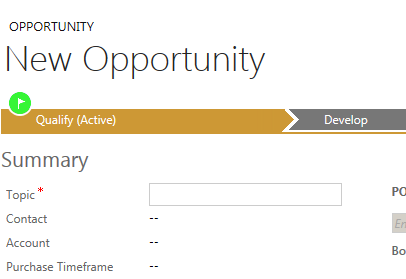 Using the CRM Explorer, I have created a plugin on post update of Opportunity. Once the plugin is created, open the RegisterFile.crmregister file in the CRMPackage project. As you can see i have manually added stageid in the filtering attribute and stageid and processid in the post image. All you now need to do is right click the CRMPackage project and select “Deploy” from the menu. once deploy is succeeded, open Plugin registration tool and you should be able to see the changes. Now as you change the stage of the opportunity, you can see that the plugin is fired and we are able to get the processid and the stageid in the post image. In CRM 2013, Microsoft has introduced the concept of actions which is a wonderful way to represent you custom business functionality in the form of a request that CRM platform would understand. Also on top of that, you can register plugins for the actions you create. However there are certain limitations when using plugins with actions. To illustrate this, lets start with a simple example. 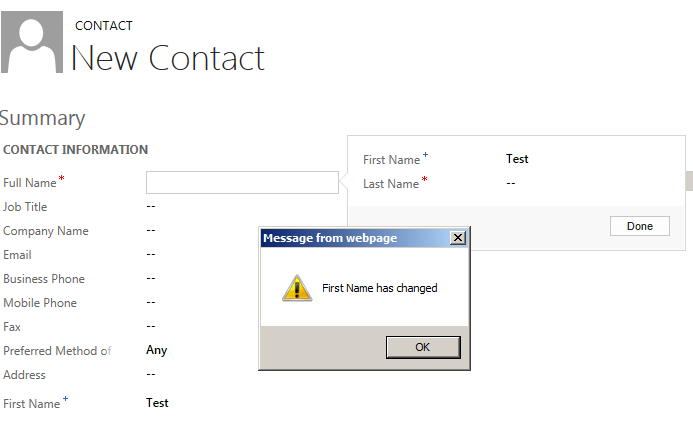 Say we create an action for contact entity named “new_TestAction” as shown in the screenshot below. Now we open the plugin registration tool and try to register a plugin on post execution of the action. 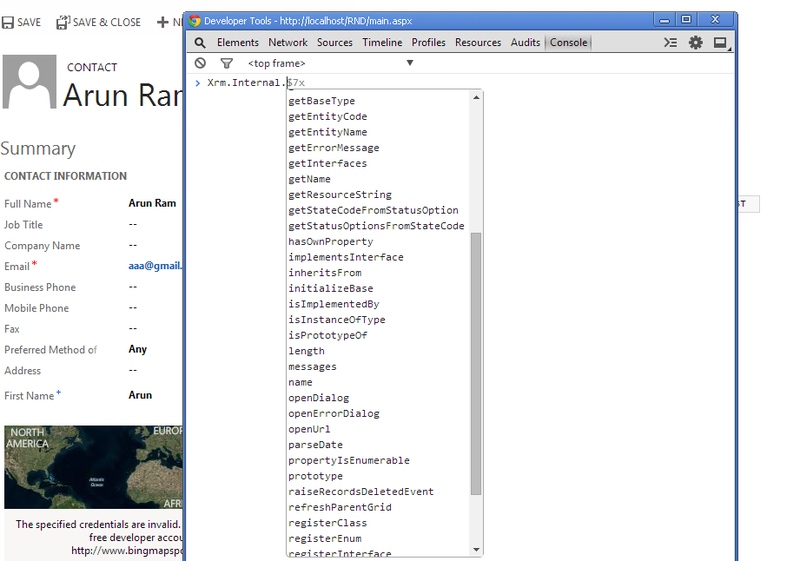 As you can see from the below screenshot, filtering attributes are not supported in that case. Also let us try to register a post image on the plugin. As you can see from the below screenshot, CRM would not allow you to register that image and gives u an error. So if you have a requirement to register a plugin on post execution of an action, please keep these limitations in minds and design accordingly. Recently in our project, we had a customer requirement where the customer asked to change the colour of image of active stage of a business process flow for Opportunity. Let’s see how this can be achieved. 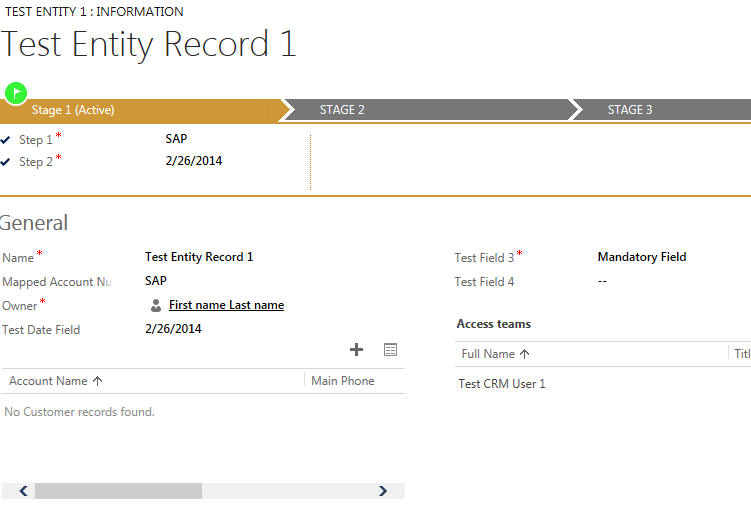 OOB in CRM 2013, the active stage flag for a business process in bluish is colour. Please check for the screenshot below. We took the .png image and modified the image using Photoshop to change the background colour to green keeping the dimensions exactly the same and then replaced the old image with the new one. Recycle the app pool, clear your browser cache and refresh the page and the changes are reflected in the CRM. Check for the screenshot below. I would suggest you take a back-up of the original image before replacing the same. Also you have to do this as a part of your deployment once you move from dev–>test–>prod. With the advent of Microsoft CRM 2013 in came business rules, a wonderful feature of the new CRM version. However with new implementations, there would be always some new confusions creeping up. Well in many training sessions on CRM 2013, i keep getting the question – “Will my onchange handlers and business rules work at the same time on the same field?”. The best way to get the answer is to try out only. So let’s do a small test which i myself faced in one of my implementations. I was faced with a scenario where I had to to do whole lot of stuffs on change of field including clearing out certain other field values. All of them but clearing stuff was possible with business rules. So had to write a custom onchange event handler for the field. And yes both the business rules and my custom code triggered. Let’s see this with a simple example. In the contact entity, for the email field I have a simple business rule which make the email field mandatory as soon as First Name field is entered/ changed by the user. Also for experimental purpose, I will register on on-change of First Name, to show a alert. Check for the screenshots below. 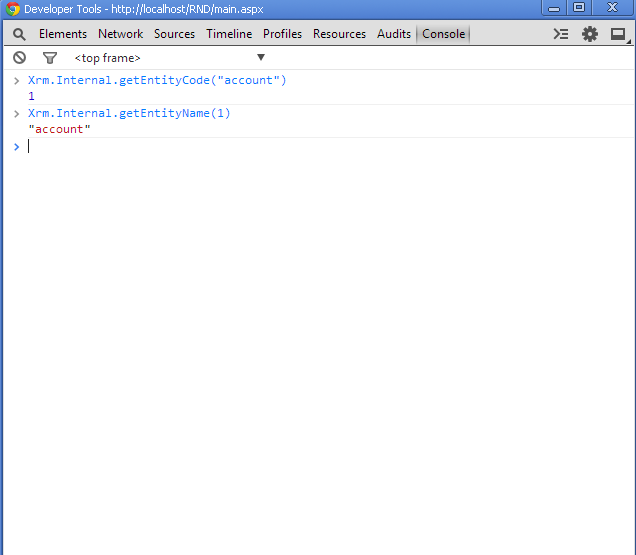 Now when I changed the First Name for a new Contact, first of all my custom jScript code fired. When I closed the alert by clicking OK, the Email field was set to Business Required by the Business Rule. So when you are designing business rules and customer onchange handlers for your implementations, please do take all this into consideration.